So the first U.S. presidential debate just ended, and initial post-debate polls have indicated that it was a victory, albeit a narrow one, for Democratic candidate Senator Barack Obama. However, as is now expected in a debate on U.S. foreign policy, the question of Pakistan was a source of disagreement between the candidates. So what was said? Republican candidate Sen. John McCain shot back, “If you’re going to point a gun at someone, you better be ready to pull the trigger…and I’m not ready to threaten Pakistan.” The presidential candidate accused Obama of threatening military strikes against Pakistan, and noted he [McCain] would cooperate with the Pakistani people, since “he knows how to work them.” Although McCain called for a new strategy in Afghanistan and Pakistan that would mirror the ‘surge’ in Iraq, it would inherently require more troops on the ground. In his rebuttal, Obama asserted that “no one talked about attacking Pakistan.” Instead, he reaffirmed his stance that, “If Pakistan is unable to attack [Al Qaeda and Taliban targets] then we should take them out.” The problem with our past strategy with Pakistan, he noted, was that Washington “coddled Musharraf,” in turn alienating the Pakistani population. Ultimately, Obama added, the United States “lost legitimacy in Pakistan” as a result of such an approach. At the peripheral level, John McCain took a much softer approach on Pakistan, emphasizing that aggressive statements about U.S. attacks against Pakistan are counter-productive and risk alienating the Pakistani population and government. He spent the majority of the time, however, criticizing Obama’s “hawkish” stance on the country. Barack Obama reiterated his previous stance, asserting that if Pakistan wouldn’t go after AQ and Taliban militants, and they were in U.S. sight, they would take them out. Reading between the lines, it is significant that McCain’s constant criticism of Obama’s stance on taking out militant targets in safe havens equated to “attacking Pakistan.” During the debate, Obama made no mention of an attack on Pakistan’s sovereignty, on its people, or on the government. He asserted that U.S. attacks on militant targets would only occur if actionable intelligence existed and the Pakistani government was unwilling to cooperate. Due to high-profile attacks, like the recent Marriott Hotel bombing, it is increasingly within Islamabad’s national interest to counter this militant threat; not to appease U.S. demands, but rather to protect its own civilians and take ownership of the war at hand. On entering a room filled with several Pakistani officials Wednesday, Palin was immediately greeted by Sherry Rehman, the country’s information minister. “And how does one keep looking that good when one is that busy?” Rehman asked Palin, drawing friendly laughter from the room. Translation: There was more grease in that meeting than on an offshore oil rig. Several hours after the blast, news agencies cited officials who said that between 30 and 40 people were killed in the blast, and at least 200 were injured. A day later, the death toll increased further, with reports finalizing that 57 people died in the bombing, and about 250 were injured. The Marriott Hotel had been largely demolished by the fire, a far cry from the vibrant hotel that had once housed some of the capital’s most popular restaurants. Although officials have not yet confirmed who perpetrated the attack, fingers have been pointed at Al Qaeda and the Taliban. Although bombings have been a frequent occurrence throughout Pakistan, large-scale attacks in main cities are significant because of the impact they have on your average citizen. They are a reality check; showing Pakistanis that bombings are no longer just occurring in the tribal areas, but at their front door. The tragedy is further humanized by the victims that many knew on a personal basis. The Marriott Hotel bombing should be the final wake-up call for both our government and for the Pakistani people, who had yet to fully embrace the war against militancy as “their war.” If anyone had doubts before, they were largely dismissed in the aftermath of Saturday’s horrific tragedy. If you would like to donate your time or money to help rehabilitate those injured in the blast or to the families of the victims, please visit the blog for The Citizens’ Trust for Victims of Terror. 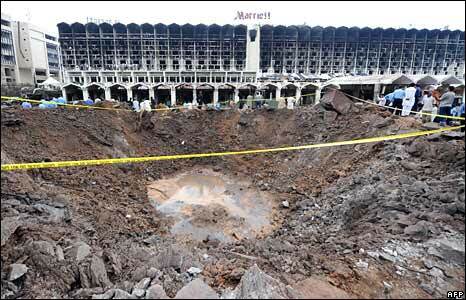 You can also donate funds to help families of the Marriott guards killed in the blast via Global Giving, click here for more information. In a videotaped message in English language forwarded to Geo News after the telephone call, which is being kept confidential by Geo in the best national interest, the group has also made many other demands from the government. So far, news agencies have not been able to authenticate the message, and Dawn noted that “no one from the government, especially the interior ministry has commented on it officially.” However, reported the news agency, “a senior official of the ministry, who did not wish to be named, told Dawn that intelligence agencies were investigating the call received by the media organizations.” So far, they have reportedly been able to confirm that the call came from within Pakistan, but not from anywhere inside Islamabad. In the recording, the group said 250 U.S. Marines and other U.S. and NATO officials were inside the hotel at the time of the attack. The group also noted that they regretted the attack, but said it was necessary to press its demands, including an end to U.S.-Pakistani joint efforts and a halt to all military operations in Pakistan’s tribal regions, reported CNN. Until the tape can be verified, we should take news of such claims with a grain of salt, particularly since it is often in the interest of more obscure militant organizations to falsely claim responsibility for attacks to increase their notoriety. While the Fidaeen-e-Islam (FI) is a terrorist organization, it is still unknown whether it possesses any links with the Tehreek-e-Taliban or Al Qaeda. Although the head of Pakistan’s Interior Ministry Rehman Malik has said the government has not yet arrested any suspects, he told reporters that suspicion is falling on militants in the tribal areas. CNN cited the official, who said yesterday, “I am not in a position to tell you who has done it, but (in) all the previous investigations, all the roads have gone to South Waziristan.” The news agency added, South Waziristan is one of seven agencies of Pakistan’s tribal areas where Taliban and al Qaeda militants are active. However, the Associated Press has reported that Amir Mohammad, an aide to leader of the Pakistani Taliban Beitullah Mehsud, said he shared the country’s grief and was not involved. Ultimately, speculation may be abound, but the government has yet to verify anything related to who perpetrated Saturday’s devastating attack. In the aftermath of Saturday’s tragedy, it is increasingly clear that very little has been verified or confirmed. What is known is that the gravity of the security situation can no longer be ignored by the Pakistani government or the Pakistani people. The tragedy of Saturday’s bombing lies in the numbers of innocent civilians that were killed or injured – not just those dining during iftar, or the foreigners present, but also the drivers, the security guards, the doormen, and the hotel workers. Many of those people were the face of the Marriott Hotel that most of us came to know over the years. Regardless whether the Marriott is rebuilt in three months or three years, we will always remember them. On the eve of President Zardari‘s visit to New York, this blast serves as a stark reminder that the Pakistani government is on the losing end of a war which is tearing apart the very fabric of Pakistani society. Our society, government, and law enforcement’s complacence is to blame for these tragic events. It may be an individual militant who pulled the trigger, but it is ultimately the state and society as a whole which has given the extremists the power that can bring a city to its knees. Intelligence warned that four to five suicide bombers were on the loose in the capital, but that still did not deter the militants’ aims. Is the resolve of the militants stronger than our government and law enforcement’s resolve? To be fair, it is extremely hard to prevent these kinds of bombings. But in the capital of the nation, a dump truck laden with several hundred kilograms of explosives was allowed to breach one of the most heavily guarded cordons in Islamabad. Surely someone must be held accountable. Driving from Rawalpindi to Islamabad, one encounters so many police checkpoints that it is hard to imagine that nobody questioned why a dump truck was making its way to the Marriott. It may be safe to assume that that road is not the typical trucker’s route. Many ministers have now come out on news channels asserting, “We won’t be scared or deterred by these attacks” and other statements to that effect. They go on to state that they will bring those to blame to justice. Those accountable for this tragedy are not only the ones hiding in the Frontier and Balochistan but they are also those in plain sight who have ignored the rise of extremism in our country. Occasionally sending in the military to fight militants is not alone going to solve the problem. Is the government still planning on registering all the madrassas and checking their curricula? Granted, not every madrassa is breeding young extremists, but a very significant number are. Is the government ignorant of where the funding is coming for these Wahhabi-styled madrassas? Are they completely incapable of keeping a check on these schools, or are they just unwilling? One cannot blame madrassas for everything that happens, but the fact remains that some of the blame lies with them. And if they run rampant as they do these days, then groups like Al Qaeda won’t even need to recruit people because they are being bred free of charge. Keeping the madrassas in check is the government’s responsibility and every successive government since Zia’s time has failed in doing so. Who will hold our government accountable? This is where civil society comes in. Our judiciary is ready to protest to the hilt when its power has been compromised, but are they ready to stand up when the law of the land is compromised by militants on a daily basis? The educated public in the cities line up to protest America’s war in Iraq but do we see them standing up and protesting the militant’s war on our own nation? 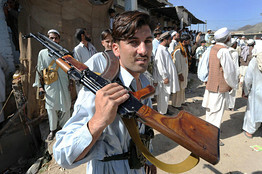 Our citizens and government officials are angered when they see America crossing over into Pakistan to fight militants. The U.S. apparently comprises Pakistan’s territorial sovereignty with these cross-border incursions. The question is, then, what sovereignty are they referring to? The Frontier and Balochistan have become the preferred destination for extremists from around the world. Why aren’t the government and public up in arms about Pakistan’s sovereignty when it is being breached by extremists? Militants from around the world and within Pakistan are launching a war against the nation of Pakistan and we seem to be concerned about America compromising our territorial integrity to fight the very people who are destabilizing our own country. It seems counter-intuitive. Nobody is suggesting that America be given free rein in our territory but our own government has completely failed in securing our tribal areas. The ISI is completely without accountability to the people of Pakistan and have aims which run contrary to the aims of the average Pakistani. Esteemed journalists like Ahmed Rashid have suggested time and again that the military and the ISI have kept the Taliban alive to serve as a tool against India. And he goes on to rightfully state that now they are out of the ISI’s control. The fact remains that the Taliban and its militant guests from around the world are fighting a war against Pakistan, not India. The ISI needs to re-evaluate its support of the Taliban if the country is to stabilize the border regions. The government needs to bring some accountability to the ISI. The public needs to bring accountability to the government by standing up and making it known that the fight against extremism is our own war and no one else’s. It’s unfortunate to say, but perhaps an attack of this nature will lead people to lose any sympathy they had for the extremists. Maybe the government will aggressively tackle the causes of and sources of extremism. Making deals with the Taliban has proven to be making a deal with the devil. One can go on endlessly about how extremism of this sort is a result of American foreign policy in the Muslim world, but that is only part of the equation. If this sort of extremism is retaliation to the West, as Muslims we should still hold our fellow Muslims accountable for reacting with such extreme violence. There is no justification for the actions of the extremists and the argument that it is America’s fault is a tired and outdated notion. American policies may have ignited the flames but we are fanning the flames by not holding our own people accountable for perpetuating the violence. Two wrongs don’t make a right. 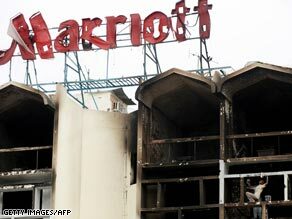 Attacking the Marriott in Islamabad has nothing to do with America’s policies in the Middle East. Pakistan teeters on the brink in plain view and it is becoming impossible to sweep it under the rug. Hopefully our government will now treat this is our own war and actually start protecting its citizens against a war which is home-grown. None of this will happen until Pakistanis and the government are ready to admit that Islamic extremism is breeding like wildfire in our own country and it is a result of our own complacence. CHUP welcomes your thoughts on this incident. If you would like to contribute a guest post on the Islamabad bomb blast, or related issues, please email changinguppakistan[at]gmail.com with your piece, name, and affiliation.